Transparency Market Research (TMR) has published a new report titled, “Vessel Sealing Devices Market - Global Industry Analysis, Size, Share, Growth, Trends, and Forecast, 2018–2026.” According to the report, the global vessel sealing devices market was valued at US$ 3.2 Bn in 2017 and is projected to expand at a CAGR of 5.2% from 2018 to 2026. Vessel sealing devices have been traditionally used in open as well as laparoscopic surgical procedures by surgeons across the world. Various players are engaged in the development of new and innovative products. A number of domestic and global players have introduced new products based on patented technologies, which have been successful in minimizing the concurrent complications of previous devices in surgical applications including stray thermal energy. Vessel sealing devices have been widely used for minimal invasive surgeries in the field of gynecology, vascular diseases, open surgery, urology, and flexible endoscopic procedures. Minimally invasive surgery has been one of the most preferred methods of treatment in the past few years among health care providers across the world. The report offers detailed segmentation of the global vessel sealing devices market based on product, surgery, application, energy, and end-user. The market has also been segmented based on region (North America, Europe, Asia Pacific, Latin America, and Middle East & Africa). In terms of product, the instruments & accessories segment dominated the global market in 2017. Factors attributed to the higher share of the segment include low cost of hand instruments leading to high demand for these products in various surgical procedures especially in emerging countries and surge in the number of players offering new and advanced hand instruments in the market. The instruments & accessories segment is projected to continue to dominate the market throughout the forecast period. The segment is anticipated to expand at a relatively higher CAGR during the forecast period owing to wide availability of products and high adoption. Rise in demand for advanced and reliable techniques to treat patients drives the global vessel sealing devices market. Vessel sealing devices are essential in surgeries related to gastroenterology, abdomen, urology, and gynecology. Majority of the players are engaged in the development of advanced products with relatively lower side effects and reduced contamination in order to increase the adoption rate among professional end-users. Additionally, significantly fragmented market and increase in investment in R&D have driven companies toward the emerging markets. 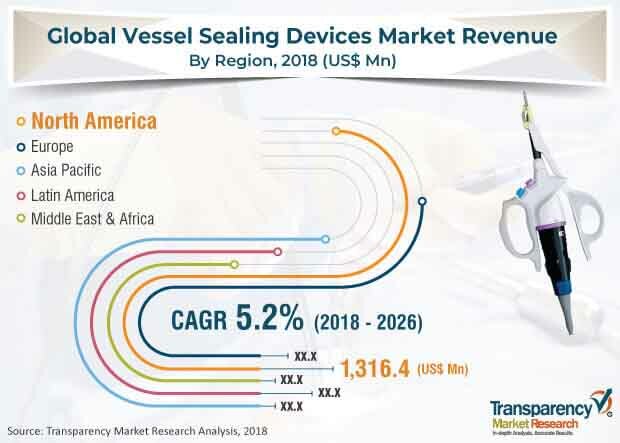 Entry into new countries in Asia Pacific, Africa, and the Middle East is enabling major players to cement their positions in the global vessel sealing devices market. Large number of vessel sealing devices are available in the global market. The global vessel sealing devices market also faces several uncertainties during the forecast period. The market is fragmented; hence, barriers to entry are less. However, high cost of R&D is expected to deter companies to enter the market. Based on application, the general surgery segment is projected to continue to dominate the global vessel sealing devices market during the forecast period. This is attributed to rise in the number of patients undergoing surgical procedures, increase in incidence of cancer, obesity, and other chronic diseases, and surge in demand for low-cost vessel sealing devices for general surgeries. However, the gynecology surgery segment is anticipated to expand at a higher CAGR in terms of revenue during the forecast period. In terms of region, North America dominated the global vessel sealing devices market in 2017 and is projected to continue its dominance during the forecast period. This is attributed to significant average selling prices of vessel sealing instruments, rise in demand for technologically advanced minimally invasive devices among surgeons, and favorable reimbursement for surgical procedures in the region. According to the Agency for Healthcare Research & Quality, of the 17.2 million surgeries performed in the U.S. in 2014, 57.8% were performed in ambulatory settings and 42.2% in hospital inpatient settings. There has been a shift in trend toward ambulatory surgery centers and outpatient settings owing to well-established reimbursement systems and low out-of-pocket expenses. This is expected to drive the hospitals & ambulatory surgery centers segment during the forecast period. The report also provides profiles of leading players operating in the global vessel sealing devices market. These include Medtronic, B. Braun Melsungen AG, Ebre Elektromedizin GmbH, Boston Scientific Corporation, Olympus Corporation, Ethicon (a Johnson and Johnson Company), Symmetry Surgical, Inc., OmniGuide Holdings, Inc., CONMED, KLS Martin, and JustRight Surgical, LLC. Medtronic and Ethicon, Inc. accounted for major shares of the global market in 2017. Expansion of Medtronic’s surgical solutions segment of the minimally invasive therapies group was attributed to the launch of LigaSure vessel sealing instruments.